Sometimes your husband asks you to go and pick him up a little something. And sometimes you go, with really good intentions, but find yourself in the woman's department anyway. Sometimes, you even take your two year old and three year old in the dressing room and let them sing way too loud and watch themselves dance in all the mirrors in the family sized dressing room. You try on a little something, and stare at yourself, not really seeing anything because you are trying to justify buying a new outfit. Because really, it is only a $32 outfit, and it has been four months since you bought yourself a new item of clothing. To your husband that would be "just a little while ago." But to you, it has been well, a dog year. You know you shouldn't, but know you will. Sometimes, when you are driving home, you wonder if you will "casually" mention your new items, or if you will lose the receipt. Oh, I have soooo been there! I'm so glad you did. Cute cute! Then dear hbby, gives me that grin. So true. Funny story-but cute outfit! Cute cute cute! Especially the red belt. Definitely lose the receipt...but then casually mention it a few months later. Cute, cute outfit. My answer to Is that new or I don't remember that? I told you about this, you were just having that selective hearing again. I know exactly what you mean! We MUST spend a little money on ourselves every once in a while, right?!!! You deserve it! 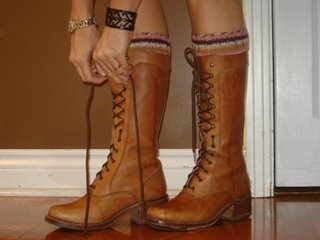 And I have some boot envy, right now, lady! Those rock! $32 worth of gorgeous, definately worth it. That looks so cute, surely he can't object to that! or "i've had it for awhile". looks great and you did do an errand after all. that warrants a treat! A new outfit is always fun. I may have just 'lost' a receipt a couple of days ago. And sometimes you pay in cash and loose the evidence. Been there ~ done that! really cute ;) and a GREAT bargain! $32 bucks! You deserve that and more! Very cute! Sometimes I'm so jealous of other people's styles! AND their amazing chandelier over their shoulder! I think I've been there and lost the receipt. :) More likely, hubby wouldn't even notice the new purchase! I'm in the lose the receipt camp. Love the boots! How come I have a feeling your hubby really wouldn't mind your new outfit? And $32? A bargain! It looks fantastic. Have fun, laugh and sing along! I lose the receipt. Or leave it in the closet for awhile or the trunk of the car. My mother passed this one on to me, be sure and get the credit card statement out of the mail before he gets home. Hee Hee. Cute outfit. you crack me up! So...which did you do? Tell or lose the receipt...Oh & did you remember to get him something?? your secret is safe with me. cute!!! Great new outfit. I assume you took it home...and lost the receipt! Enjoy! you are so darn cute in your new outfit! I think we can all give you a big old Amen to this one. You look adorable in your new duds and fourth months is waaaayyyyy too long if you ask me. oh honey- lose the receipt, cut the tags off in the car in the way home, sneak it into the closet and never ever tell! I just want to tell you that I LOVE your blog! But I have to ask, HOW DO YOU DO IT ALL?!?! I only have 2 kids, and I can't seem to do HALF of what you do!! Do you sleep? Kate, - also mention to Arthur that what I bought was "on sale" or I say "You are never going to believe how well I did shopping". Endulge you deserve it. BTW the red belt is SO me!! Love it! Sometimes you just deserve it. :) Especially when it's so cute on you! ha... i love this post. so happy you got a new outfit. it looks so great on you.